MFG Tray conveyor and assembly trays feature a low-profile design and radial edges to readily accommodate conveyor transport and assembly operations in a wide variety of applications. 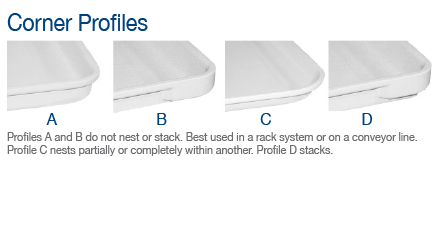 Four distinct corner profiles are available to integrate with rack systems and conveyors, or for nesting or stacking capabilities. Their dimensional stability and light weight ensure easy transporting and handling. 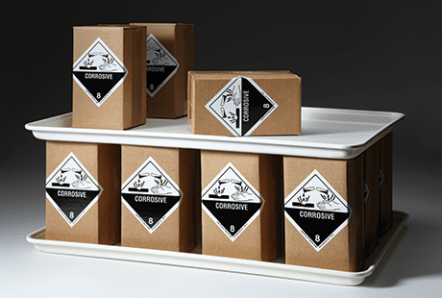 Composite construction enables these trays to be constantly used in temperatures ranging from -60° to 250° F (-51° to 121° C) and intermittently in temperatures up to 300° F. They are resistant to cutting oils, greases, radiation, and mild acids and alkaline solutions within a pH rating of 3.0 – 10.0. And, unlike many thermoplastic units, they will not melt when in contact with most hot objects.